When you want your selfies to say Club Life, but your plate more like First We Eat. What to expect: Weekend DJ is spinning some beats by the terrace facing Miracle Mile. You can either people-watch or go to the bar inside where teal and hot pink lights reflect on the clear, swirly bar seats. Tables in the center of the room have a galaxy-like design on them, and large booths towards the left side of the room are comfortable for larger groups. The Menu: From unique entrees like the Roasted Pumpkin Sorrentinos, to new creations on the sushi menu with ingredients like peanut praline to pickled cucumber, you can delight your taste buds in more than one way. 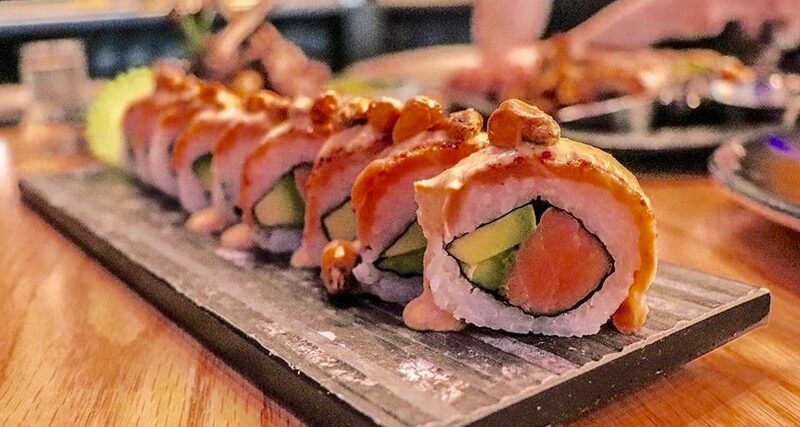 What to order: For date night, you can share a roll like the Huancaina with cooked shrimp and topped with salmon. Then try the Shrimp Chaufa Rice Wok because sharing is caring. Larger dinner parties can benefit from the combo sushi platters with up to 45 pieces. Niguiri Anticuchero: Our favorite roll from the four we tried because of the smoked salmon and lemony emulsion. It even has a little kick to it. The toasted corn on top made all the difference. Soul Roll: This is for dessert lovers. The “No Rice No Nori” roll is made with hearts of palm, salmon, then covered with cream cheese and crushed almond praline. Order this when you want dessert first, but just as an FYI it’s not overly sweet. Filet Mignon: In a salsa de crema, this meat is pink in the center and has the grilled marks on the top and bottom. It rests on small potatoes over a cream with a hint of blue cheese. Off the menu: Coming to the menu real soon is the seafood platter. It includes shrimp on skewers inside a giant lobster tail. Mussels, fried calamari, and even a snapper fillet under the lobster. This is definitely a shareable dish. How to score a table: Reservations can be made online using OpenTable. Make sure you ask for a table in the terrace facing the Mile.